Today, on the occasion of Dussehra, we celebrate the triumph of good over evil as Lord Ram vanquishes Ravana and peace is restored. 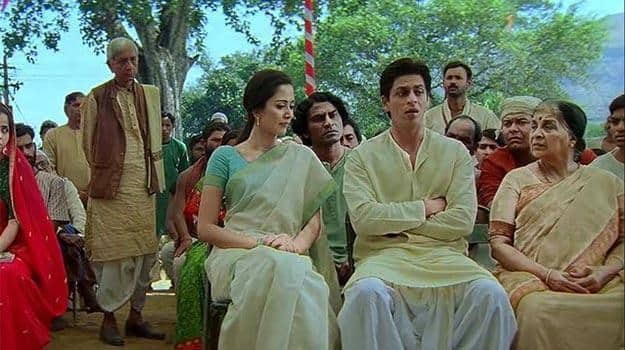 In the movie Swades, Dussehra is given some extra importance as an underlying commentary about the true issues or “evils” plaguing our country. Two scenes stand out with regards to this festival in Charanpur. In the first scene, we can see the new students getting admission in the village school. These new students are from varied castes, and for the first time, kids from all backgrounds would be coming together and studying in the same space. The triumph of good over the evils of caste system. We also see the NRI Mohan Bhargav decked up in the colors of the village as he dons a traditional dhoti and kurta for the celebration. It is here where we get to know what Mohan Bhargav thinks about the “greatness” of India. It is here where he talks about all the evils plaguing our society and the need to address and vanquish these evils in order to achieve our full potential of greatness. This scene is one of SRK’s career best scenes. From the school we move on to the enactment of Ram Raavan war during the village celebration. This entire scene is enacted as a street play in the quaint village. Here Mohan Bhargav brings out the real meaning of celebrating Dussehra. The real meaning of conquest of good over evil. and “Man Se Raavan Jo Nikale, Ram Usake Man Mein Hain” he makes the villagers realize the true meaning of good and evil. This is also the place where he decides to bring electricity to the village. So on this Dussehra, let us promise to celebrate with the true meaning of vanquishing the evil within us first. SRKUniverse wishes everyone a very Happy Dussehra.